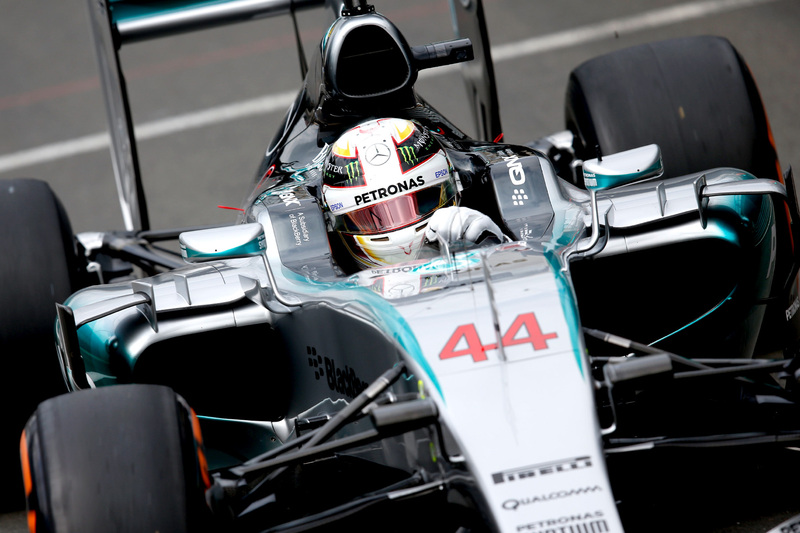 Lewis Hamilton has emerged victorious from the thrilling mixed weather 2015 British Grand Prix. The home crowd hero started on pole, but was swamped off the line by the fast-starting Williams cars. His Mercedes team strategised his way past them, however, by exploiting Williams’ strategic inexperience and pre-empting the first pit stop on lap 20. The Briton emerged in front once the Felipe Massa, Valtteri Bottas, and Mercedes teammate Nico Rosberg made their stops, and held on to the win from there. “Firstly, this is a very special weekend for me,” said Hamilton. “To see so many fans out this weekend — I thought that I’d seen it all here last year, but I really just love these guys, Thank you so much for coming. “The race was very tough, and it was very slippery off the start for both [Nico and I], but it made it more exciting to chase down the Williams. Two bands of rain spiced up the race in a grand prix that lacked nothing. The first light shower arrived on lap 38, but was only enough to enable Nico Rosberg past the two Williams cars separating him from P2 with his Mercedes’ superior downforce. A second more significant shower arrived on lap 43, prompting the entire field to switch to intermediates, but without threatening Mercedes’ dominance. “The rain came and I lost temperature in my front tyres,” recounted Hamilton. “It’s always tricky for the guy in the lead because you’re the first person to get to [the rain]. The biggest winner in the wet weather, however, was Sebastian Vettel, who was having an otherwise underwhelming day. Vettel spent most of his race in the bottom half of the top 10 and stuck behind teammate Kimi Räikkönen after a poor start, but the wet weather brought his race alive. With slicks on, Vettel breezed up the field and past Räikkönen, and then jumped the Williams cars when the field switched to the green intermediate weather tyres, where he settled until the end of the grand prix. The race was a story of loss for Williams, however, after Massa rocketed off the line to seize the lead from the Mercedes duo well before the first corner, with Bottas following close behind. Hamilton, who spoke for most of the week about the importance of nailing his starts, was having none of it, however, and snatched second place back from Bottas before setting upon Massa. Behind the fight for the lead the two Lotus cars of Pastor Maldonado and Romain Grosjean tangled on the first lap, and in the process knocked Fernando Alonso into Jenson Button and triggered a safety car. Both black and gold cars were immediately retired, as was Button’s McLaren, but Alonso was able to continue after a brief pit stop for a new nose. The safety car came in on lap four and Hamilton attempted to jump Massa at the first safety car line, but he locked up and ran wide at turn one, opening the door for Valtteri Bottas, dropping the home favourite down to third. The race was on, but on lap 11 Williams radioed its drivers to tell them to hold formation rather than risk a potentially messy battle. It was clear almost immediately that Bottas was having none of it, and he attempted to pass along the back straight. “I have more pace. I can overtake, I can do it on the back street,” he pleaded over the radio. At his attempt on the next lap, the team conceded to Bottas’s increasingly obvious superior pace. But Bottas began wearing on the under-pressure front-left tyre and couldn’t make a move stick, confining him to second place. Mercedes then rolled the dice on a pit stop for Hamilton, hoping to push Williams into breaking its pre-race strategic expectations, on lap 20. Felipe Massa reacted to Hamilton’s stop on the next lap by boxing, and Mercedes piled on the pressure by having Rosberg follow him in. Rosberg’s stop was marginally quicker, and the pair were released side-by-side down the pit lane for a speed-limited race to the pit exit. Massa pulled ahead, however, but both were behind Hamilton — the decisive strategic moment of the race. Bottas stopped on the next lap, and exited the pit lane in between the warring Massa and Rosberg, eventually muscling his way past the latter to resume his feud with Massa. Hamilton, meanwhile, had extended his margin to 3.3 seconds, much to the delight of the British fans. As the grand prix settled into its mid-race rhythm the weather forecasts began predicting slow-moving rain to hit the track in the last 30 minutes of the race. It arrived on cue, but wasn’t heavy enough initially to warrant wet tyres. The weather nonetheless separated the high-downforce cars from the rest, which saw the Williams cars slip back into the field and towards the resurgent Sebastian Vettel. A second band of heavier rain arrived shortly after, prompting widespread changes to intermediate tyres during which Ferrari got Vettel ahead of the struggling Williams duo. The race, and even a podium place, was lost to Williams. Elsewhere in the classifications Kimi Räikkönen was unable to capitalise on his P5 qualification after he and the team erroneously pitted him for intermediate tyres during the first light band of rain. Those tyres overheated with the lack of standing water, requiring the Ferrari driver to complete another stop for new wet-weather rubber, destroying his race. Fernando Alonso gave McLaren the slimmest of reasons to keep their chins up with his first point of the year after finishing tenth — albeit out of only 13 finishers.